A part of me feels the need to reflect or explain my lack of blogging, but the only real explanation is...I haven't made the time! I miss blogging, and have ideas for posts all the time, but ,when it comes down to it, in my free time I choose other things than writing in this space regularly! That being said, GRAY KITCHENS have inspired me to sit down and blog. Some of you may have seen on my Instastories last week that we're doing some very minor kitchen updates. And when I say minor, I mean it--just a few cosmetic changes that I'm hoping will make a big impact. I've never loved our kitchen. 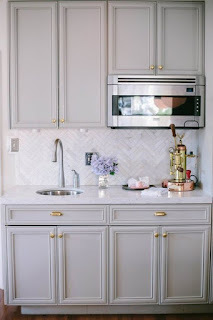 The oak cabinets just feel blah to me, our granite is black with brown and gray flecks which I'd never ever choose myself...and to top it all off it has popcorn ceilings with terrible lighting. You can get a little glimpse here. All that said, it's a starter home, and upgraded enough. This just isn't the home to put time, money, and resources into creating a "dream kitchen," so we've kept things as is. That being said, we had a leak from our bathtub above the kitchen that's caused some damage to the ceiling. The leak has been tackled, but the ceiling could use some work and we decided to use the damage as an opportunity to get rid of the popcorn ceiling and update the lighting! We might also paint the walls in the meantime. I'm thinking something like Sherwin Williams Sea Salt. For lighting, I've ordered this flush mount in Natural Brass and am considering this or this small pendant in brass for above our sink. I might also update some of our hardware. Finally, we're going to have a roman shade made in this fabric for the window above the sink. I'm on the hunt for an aqua/turquoise trim to add a little color to it as a border on the shade. Thinking grosgrain might be a nice, preppy pop! 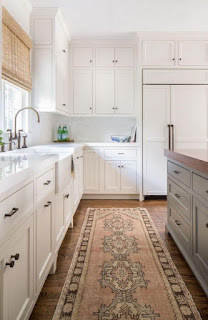 So you might be thinking, where does the "Gray Kitchen Love" come in? The only gray you've mentioned is the gray specks in the granite you don't like. Well...a dream would be to have our cabinets re-done. 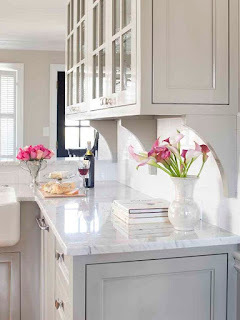 I've always dreamed of a white kitchen with marble countertops. In fact, I've wanted to paint our cabinets white forever...until seeing the Insta picture above! I immediately took a screenshot when first seeing itand haven't been able to stop thinking about this fabulous butler's pantry since! And now...I think that I may prefer gray cabinets to white! We have white appliances, all in great working order, so gray really wouldn't work in our kitchen, but it's still fun to dream! Also loving the mix of white and gray cabinetry in these photos. Best of both worlds? Gray is having a big moment right now, and in a few more years it may feel dated. At least I'm in no hurry to make a decision! How do you balance home updates with budget and life stage? Do you find yourself swayed by trends? Yay you're back and yes to gray cabinets. It's such a versatile neutral that I think it has lasting power. 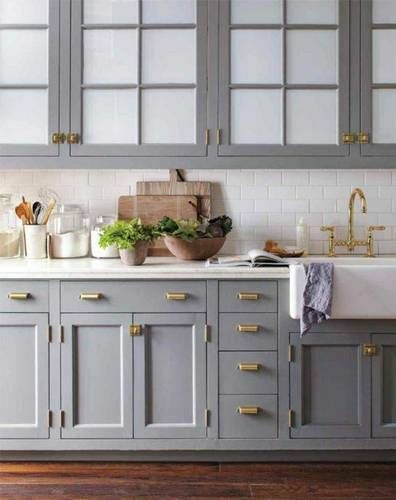 Getting your cabinets spray painted can be really budget friendly and make a huge difference! So, we've struggled with this a lot too. Ours is a starter house or we might stay and add on- but I would want a bigger kitchen at that point. Anyway we decided to spend about 2k to make it nicer for now and it will always help if we sell. So we (my husband) painted the cabinets a blue gray and added new hardware! We got a new sink (the bulk of the $$) and countertops (which was free so that doesn't count) and added a bunch of subway tile. I think the paint and subway tile really made it awesome! And it was so cheap. Highly recommend that. I totally think gray and brass will look outdated very soon. I already kind of think it does (don't shoot me. Ha.) However, if you plan on selling in a year or so, go gray because it will still be "IN" and will show well. 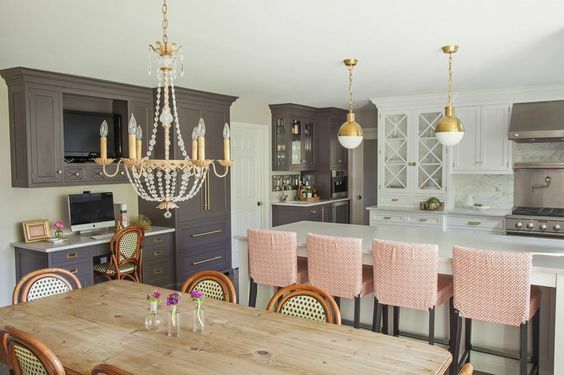 These kitchens are gorgeous!!! I do think it's trendy but overall I think kitchens are always trendy (I really can't think of a "classic" kitchen). We have 1966 laminate countertops and our cabinets were two tone when we moved in! They are white now, and other than replacing things as they break (we still have our 1966 stove and oven) - we're holding out for our renovation! 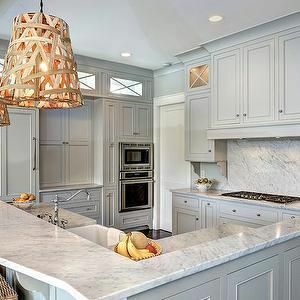 I wouldn't worry about doing too much to your home if it's a starter, being able to say "granite countertops" is a big "thing" even if it's not a color you like! Also we used sea salt at 50%, I thought it would be more neutral but it's a lot of color! Do the gray. We had a typical 1990's golden oak kitchen cabinet. It's a pretty big kitchen. We had someone come in and give us an estimate to reface the kitchen $23,000. No way could we afford it. We put new hinges that are self closing $300 on the cabinets. Gray paint on the cabinets $150. New handles less than $100. Splurged on quartz countertops $4000 white with gray. We started with our old white appliances. It looked great. Stove broke replaced with stainless, sale on refrigerator added that a couple of months later (ours was 27 years old). New stainless dishwasher replacing a white dishwasher that I loved another splurge. When people came to visit they thought we had a new kitchen. Stainless is the trend and it is beautiful but the white appliances looked just as nice if not nicer, more of a contrast. Almost a year later and the painted cabinets still look new. So glad you're back! I have a love/hate relationship with grey (or any 'non traditional' kitchen color) just because you NEVER know when it will become dated! Same goes with subway tile in the kitchen! I love the look, just don't know if i could ever spend the $$ on going grey! 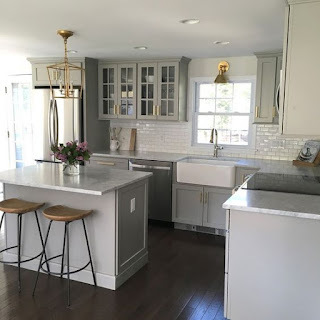 I do have a friend that just re-did her kitchen...she opted for the grey cabinets with white marble countertop and i am IN LOVE. She also kept the traditional elements though, that i think 'mute' the grey a little: dark hardwoods, brick fireplace (original to home), dark walls, and a brown island. It's lovely!